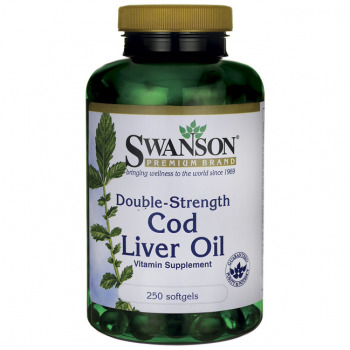 Swanson Double-Strength Cod Liver Oil is a step above traditional cod liver oils. This high-potency formula features vitamins A and D to promote strong bones and healthy eyes, skin and immune function. Each softgel delivers 2,500 IU of vitamin A and 270 IU of vitamin D for effective daily supplementation. Suggested Use: As a dietary supplement, take one softgel one to three times per day with food and water. Women who are pregnant or likely to become pregnant should not exceed recommended dose. ecoMarine® is a registered trademark of Marine Nutriceutical Corp., exclusively licensed to Swanson Health Products.